Carol Fitzgerald of KidsReads.com, TeenReads.com and The Book Report Network joined us to offer her recommendations for the best new books to give as gifts for children of all ages. WHAT DO WE HAVE FOR THE YOUNGER READERS? "Gallop" by Rufus Butler Seder (Workman) has something fascinating called scanimation: Short lines of text are accompanied by moving pictures. The youngest kids (and their parents) will find incredible entertainment with each turn of the page. Another great picture book is "The Wizard" by Jack Prelutsky with illustrations by Brandon Dorman (HarperCollins). The combination of illustrations and poetry are simply brilliant. WE HAVE THE MIDDLE SCHOOL KIDS. ISN'T THIS THE AGE WHERE MANY BOYS LOSE INTEREST IN READING? That's true, but if you find the books they want to read now, you keep that passion for reading alive. These days there are so many great books for boys. In fact we have a feature called just that on Kidsreads.com, which has a collection of more than 65 titles, which we KNOW will get boys reading. Series books are favorites of middle school readers. When children fall in love with series books they really gravitate to the entire collection of titles that create a lasting loyalty to the series. "The Seems" by John Hulme and Michael Wexler (Bloomsbury) - Becker Drane is a 12 year-old boy who works as a Fixer for The Seems, a secret organization that ensures our world keeps running, and more importantly, sticks to The Plan that's been made for it. As it turns out, Becker is the most talented Fixer who can save The Seems, even if he is only 12. "Mysterious Benedict Society" by Trenton Lee Stewart (Little Brown) - ARE YOU A GIFTED CHILD LOOKING FOR SPECIAL OPPORTUNITIES? Dozens of children respond to this peculiar ad in the newspaper and are then put through a series of mind-bending tests. Only four succeed. Their challenge: to go on a secret mission that only the most intelligent and inventive children could complete. To accomplish it, they will have to go undercover at the Learning Institute for the Very Enlightened, where there are no rules. But what they'll find in the hidden labyrinth of the school's underground tunnels is more than your average school supplies. "Alex and the Ironic Gentleman" by Adrienne Kress (Weinstein) - This book tells the story of Alex Morningside, an inquisitive 10-and-a-half-year-old girl who lives with her uncle above a doorknob shop. With secrets of buried treasure and a smart mixture of fantasy and high adventure, kids will want to be just like Alex. "MOLLY MOON, MICKY MINUS, & THE MIND MACHINE" by Georgia Byng (HarperCollins) - With the help of her long-lost brother, Micky Minus, everyone's favorite hypnotist must now use her telepathic powers to save the world from an evil Superbrain. Can Molly's secret hypnosis crystals ward of tsunamis, twisters and heat waves thrown at her by a massive weather machine in time to find safety on the other side of the rainbow? WHAT ELSE DO YOU HAVE FOR THIS AGE GROUP? The next two are stand-alone titles that we absolutely love. The first is "Elijah of Buxton" by Christopher Paul Curtis (Scholastic), who has already won awards for "The Watsons Go to Birmingham" and "Bud, Not Buddy." This story is about Elijah, a boy who is the first child born into freedom in just over the border from Detroit in a settlement of runaway slaves. When another former slave steals money from Elijah's friend who was saving up to free his own family from slavery, Elijah decides to chase the thief back across the border and discovers the horrible life his parents had escaped. WHAT DO YOU HAVE FOR RELUCTANT READERS, THE KIDS WHO JUST DO NOT LIKE READING? Some reluctant readers like to read books just for information instead of a story and this is where "Do Not Open" is a great choice because it's a challenge to NOT open it, but once that happens there are great pieces of information that really are compelling to anyone. "Do Not Open" is right in line with DK's New York Times bestseller "Pick Me Up," and uses the same irreverent style to explore all the things "THEY" don't want you know about. From the Mona Lisa's hidden past to the history of Area 51, "Do Not Open" explores lost worlds, unravels secret codes, and lets readers step through the looking glass to see if they can handle the truth! This is a format that has really started to come into its own over the last year or so. A graphic novel is really a long-form comic book and it can include all sorts of stories, from the manga-style books out of Japan to the traditional western style. It's not just super heroes! "Owly" by Andy Runton (Top Shelf) - For the really young there is "Owly," a very sweet wordless graphic novel that encourages kids to tell or describe the story to you. When you study the images that Andy uses in the storytelling you realize that it really can take a thousand words to describe what you see. "Bone" by Jeff Smith (Scholastic) - Jeff Smith really created some of the funniest characters in the history of graphic novels with the Bone Cousins. They are Fone Bone, Phoney Bone, and Smiley Bone. Kids just bond with these stories and what is even more surprising are the parents who discover how much fun they have reading this series. WHAT ABOUT BOOKS FOR TEENS? 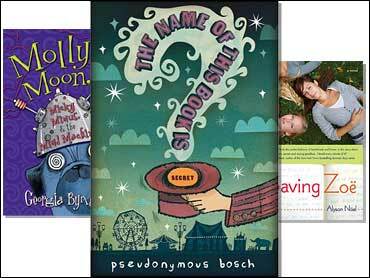 Here are three books that have been huge hits with teen girls on Teenreads.com. They are well-crafted with unexpected plotlines that touch on themes of love, loss and self-discovery. The first is "Guyaholic" by Carolyn Mackler (Candlewick), a favorite Teenreads.com author for many years now. Vee Valentine is pretty much a mess of a kid. Her mom dumped her with her grandparents. She bounces from guy to guy, but things start to change in the spring of senior year, when she meets Sam Almond and she discovers what a meaningful relationship can be. On the afternoon of graduation things spin out of control and she ends up risking losing Sam forever. Vee ends up on a cross-country road trip to go see her mom and really to escape the mess she left back home. The second is "Saving Zoe" by Alyson Noel (St. Martin's Griffin). Echo is a typical teen trying to survive high school without being totally traumatized by boy trouble, friend drama and school issues. She is also doing her best to cope with the murder of her sister Zoë. She is handed her sister's diary and from there learns a lot about the sister she thought she knew. "Memoirs of a Teenage Amnesiac" by Gabrielle Zevin (FSG) - This is a great story about a girl who is trying to recover from amnesia she suffered when she fell and hit her head on some steps. She discovers that she can't really remember her boyfriend or why she may have fallen in love with him, she can't understand why her best friend keeps calling her "Chief"…and she would certainly know about her mom's new family. And then there is James the boy who says he once wanted to kiss her. What a fun read! DO YOU HAVE ANYTHING THAT THE WHOLE FAMILY CAN ENJOY? We were truly thrilled by a book called "Great Joy" by Kate DiCamillo with illustrations by Bagram Ibatoulline (Candlewick). This is a book that we at Kidsreads.com are calling an Insta-Classic. We love the old-fashioned illustrations as much as the prose. And last but not least is a book that they'll love as a stocking stuffer: "Winter in White: A mini pop-up book" by Robert Sabuda (S&S). Pick up a couple of these as great items that will be "forever" books, meaning you bring them out each holiday season. We recommend these be kept in a "high place" until it's time to read them for the family. These books are a lot of fun to experience but are delicate and not really made for a lot of handling. They will immediately become family favorites.